The Combi Rail Pro Light is a flexible picture hanging system that includes picture lighting. This wall rail has a beautiful, neutral design making it easy to integrate in any room. Thanks to the movable fittings, it is possible to illuminate pictures and other wall decorations with optimal, high-quality lighting. In addition, you can easily change or move art and pictures as often as you like and without damaging the walls thanks to the flexible hanging system. Mounting the rail and installing the power supply is quick (3 steps) and easy without the need for special tools or techniques. In step 1, you mount the clips (Click&Connect) to the wall and click the rail into the clips, immediately installing the rail firmly in the right place. The power supply is installed during step 2. Step 3 involves mounting the fittings for the picture lighting; a quarter turn and they’re firmly and quickly installed in the right place on the rail. The fittings are suitable for LED and halogen lamps, and are available in lengths of 50 cm and 70 cm. Made from high-quality plastic and resistant to high temperatures, you can adjust the luminaire cover to the desired angle to illuminate the picture without burning your fingers. All the components of the Combi Rail Pro Light have been approved by reputable, independent certification authorities. 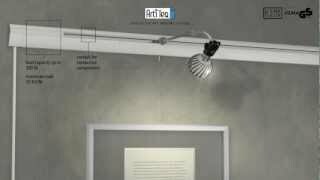 The hanging rail with picture lighting has a separate conductor for the hanging cords and/or rods, so that these can be moved independently of the conductive parts.